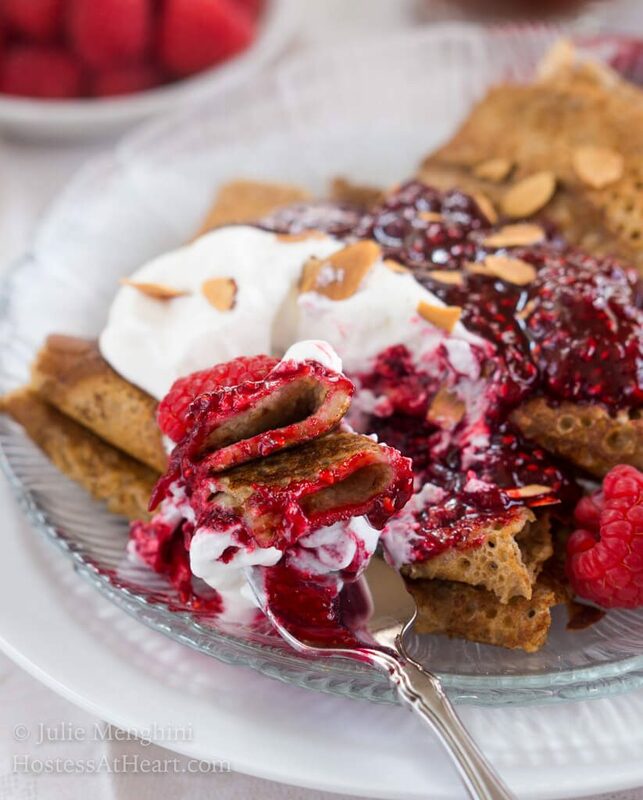 Swedish Pancakes with Raspberry Compote is a little taste of decadence with a big side of amazing. 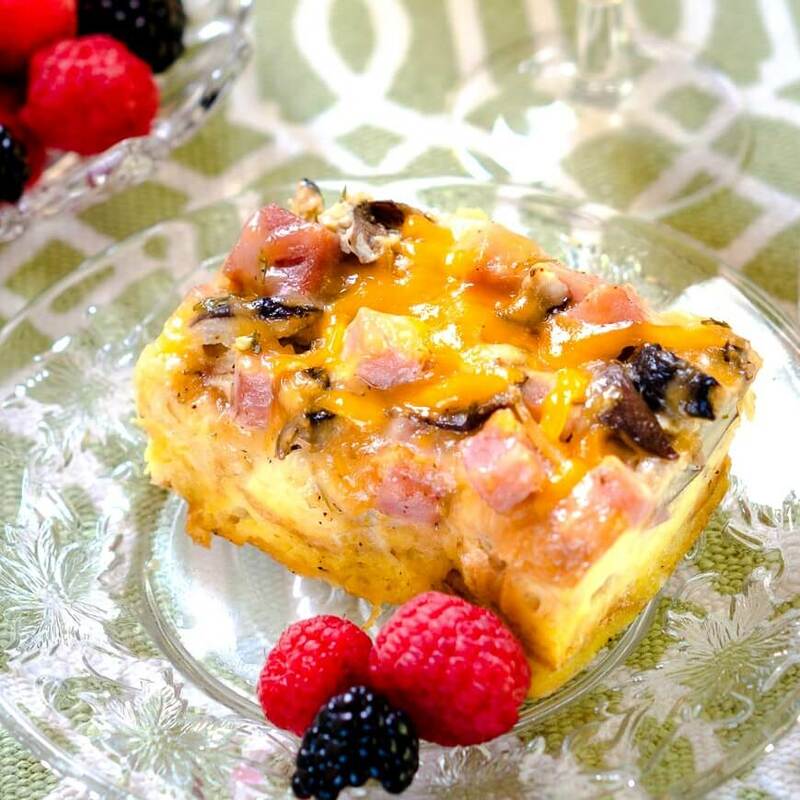 They’re the perfect brunch or breakfast when you’re looking for that wow factor. 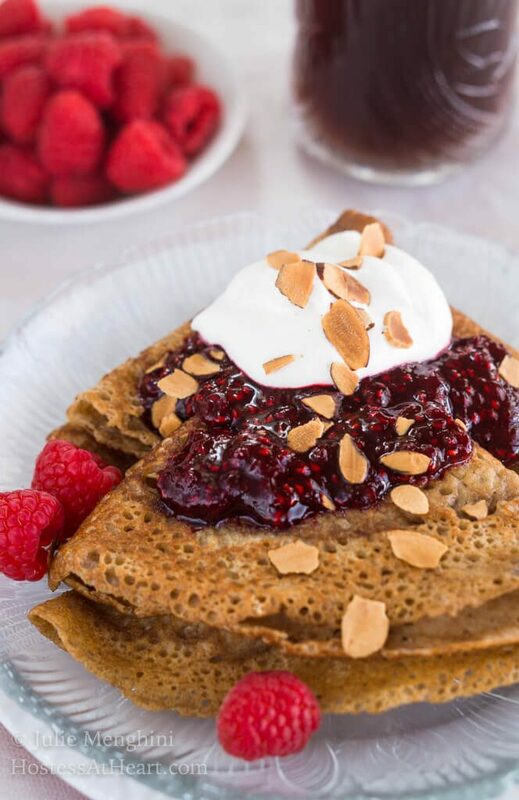 These Swedish Pancakes with Raspberry Compote are a delicate pancake that is just as delicious to eat as they are striking to look at. This whole wheat version is topped with a decadent raspberry compote, homemade whipped cream, and toasted almonds. We’re talking 4-star restaurant stuff here folks! National Pancake week is in February! O.k., I didn’t know it either until Wendy from A Day In the Life On The Farm picked “Pancakes” theme for this month’s Bread Bakers event. I just love this group because it’s pushed me to make things that I wanted to but probably wouldn’t have. This group is made up of people all over the world in a variety of cultures. I see recipes that I wouldn’t otherwise. A couple of years ago we were on vacation in Colorado and there was this food truck that sold crepes. At that time I couldn’t say that I’d ever eaten one but was amazed that they had a long line to order one all day long. My daughter who lived in France for a time was obsessed with a good crepe so I eventually tried them and learned what the buzz was all about. Amazing! 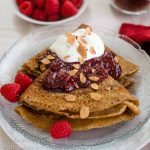 These Swedish pancakes with Raspberry Compote might not qualify as a crepe but, to me, they are very similar. 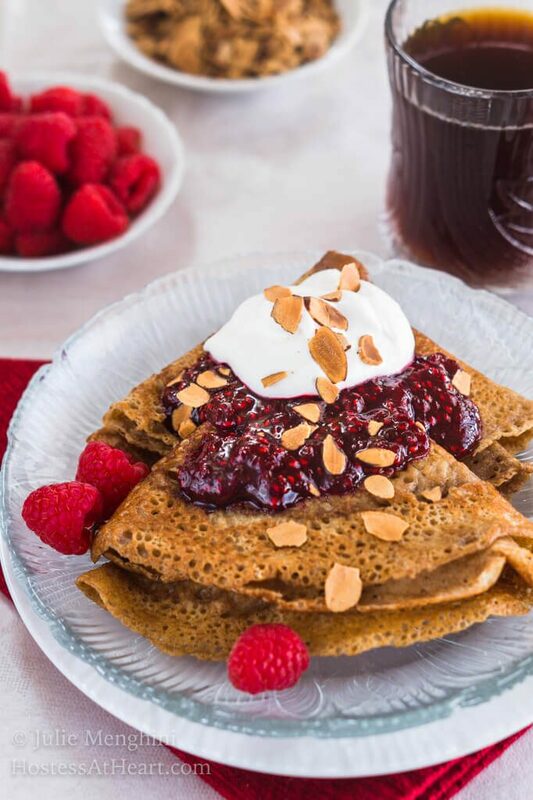 They are a flavorful thin batter that cooks into a light lacy pancake that is perfect as is or with a topping like this beautiful raspberry compote, homemade whipped cream, and toasted almonds. Combine raspberries, sugar and vanilla extract together in a medium-sized saucepan. Cook over medium heat for approximately 20 minutes. Cool completely. Compote will thicken as it cools. Preheat the oven to 350°F. Put a piece of parchment paper on a rimmed baking sheet. Spread almonds over parchment paper and toast until browned. 10 to 15 minutes. Reduce the oven to 200°F and line the rimmed baking sheet with parchment paper. This pan will be used to place cooked pancakes in the oven to stay warm. In a medium-sized bowl combine the flour and salt. In a large-sized bowl whisk eggs together and then milk and cream. Gradually whisk dry ingredients into wet ingredients. The batter will be thin. Fold each pancake in half and then half again to form a triangle. 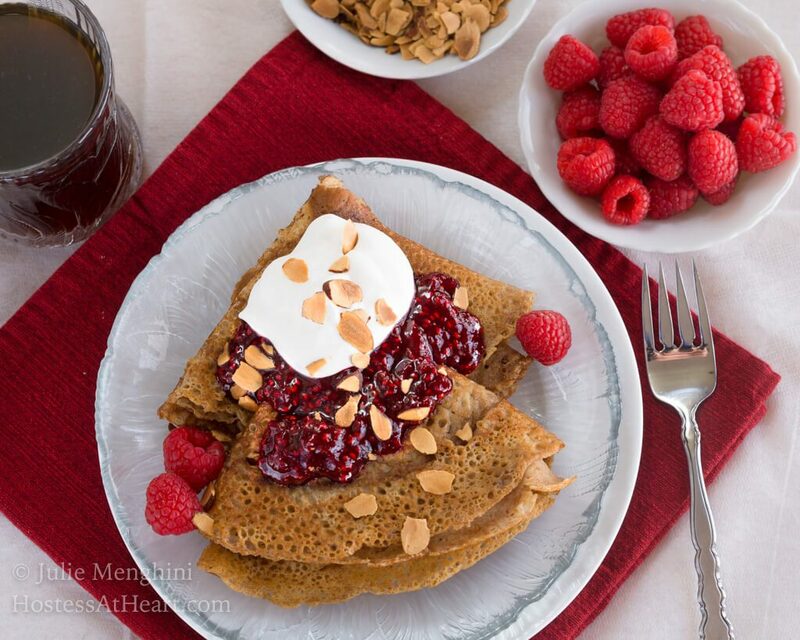 Spoon raspberry compote over pancake followed by whipping cream and slivered almonds. Serve immediately. Pancakes may be stored in an air-tight container in the refrigerator 1 to 2 days. Store raspberry compote and whipping cream separately. Calories are based on all of the raspberries and whipped cream being used. I didn't need all of it. 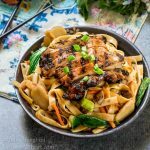 I make a lot of quick and easy recipes but have to admit that these took a bit of time to make and got much easier as I went. They were really worth the time they took. 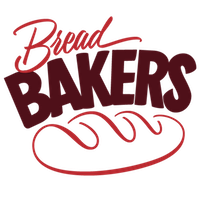 Now it’s time to see what my friends from Bread Bakers made! 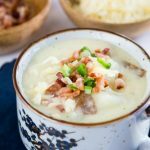 Now here are a couple more breakfasts that we loved! OMG! OMG! OMG!!! I love these pancakes. 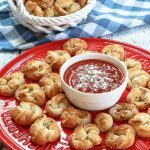 Must try making them with strawberries (my substitute for raspberries ) for my girls. They will love them. Thank you! We really loved them! The original recipe used lingonberries which I didn’t have so used the raspberries. I almost went with strawberries which would also be amazing. Hello Julie, What a riot of colours on the plate. The colour of raspberry compote is just amazing. The pancakes are whole wheat and so healthy. This is such a healthy and beautiful platter. Your say four stars? I call it five start stuff! Thank you so much Namita! We really loved these pancakes and raspberry is one of our favorite fruits too. Wow, just wow, loving it!!! warm crepes with compote and cream, yummilicious!!!! Thank you so much, Priya! This was a great challenge for me! I’m drooling and hungry! The clicks remind me of the pancakes and crepes that I have as brunch in the numerous eateries during my visit to Montreal. Just beautiful. Thank you so much, Mayuri! 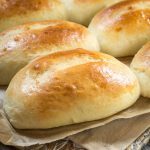 It’s the first time I made them and we really enjoyed them! Wow factor is right!! These are gorgeous! I’m a sucker for raspberries – I’d be so pleased if this was put in front of me for breakfast! Thank you, Katherine! We really love raspberries too. The original recipe called for lingonberries and some kind of juice that I’d never heard of so this was an obvious alternative for us. Wow, those crepes/ Swedish pancakes look absolutely amazing. These will sure make for a fancy and special breakfast. Thank you, Pavani! We really loved this breakfast too. I’d love a fork full of those pancakes. Or a plate full! Thank you, Karen! I really loved being pushed to try them so this challenge was perfect for me. Wow – quite a dessert Julie! I knew someone who would eat this any time of the day 🙂 They do look more like crepes which I happen to love. 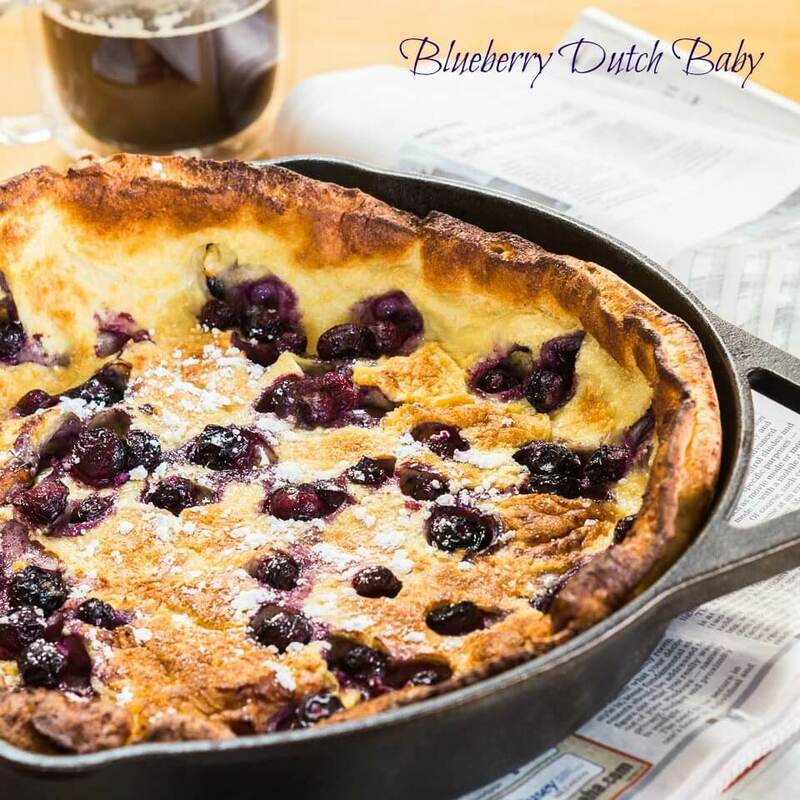 Are Swedish pancakes made with whole wheat flour or did you choose to use that kind of flour? I don’t believe that they use Whole Wheat traditionally but adapted this from a recipe I saw in F&W. I was hoping it wouldn’t be dry and they really weren’t. We loved them. Thank you Judi! 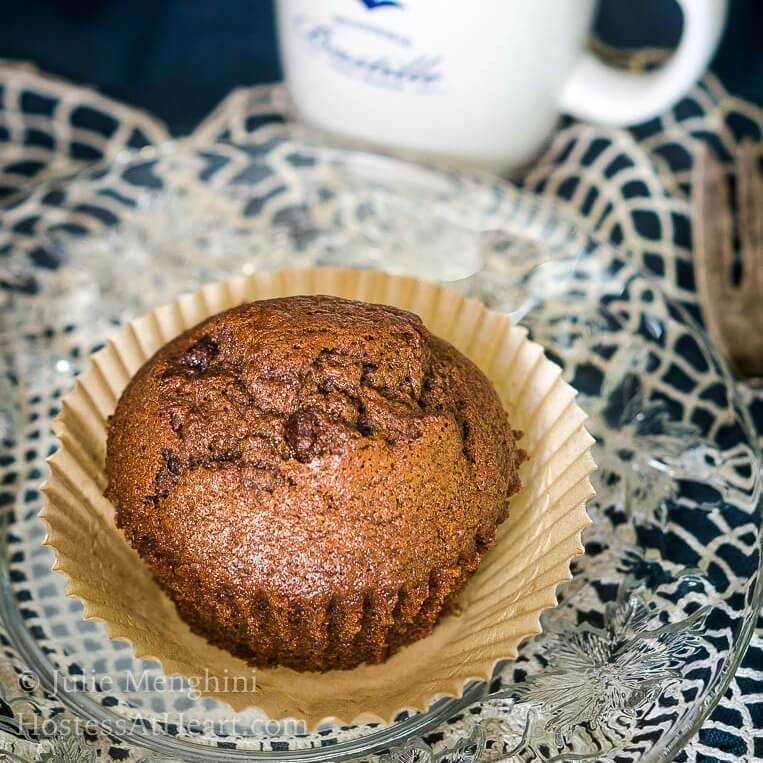 I’ve never made them before and sometimes whole wheat can make bakery tough but these were really light and delicious. Perfect, delicate pancakes and I love that they are made with whole wheat flour.